The National Maintenance Agreements Policy Committee, Inc. (NMAPC) annually sponsors the Zero Injury Safety Awards® (ZISA®), the premier safety recognition program in the union construction and maintenance industry. Each Zero Injury Safety Award® recognizes an alliance between owner-clients, signatory contractors and local and international unions who worked together in a tripartite fashion to achieve zero injuries on their industrial construction and maintenance projects. At the ZISA® Gala held on November 2, 2017, in Washington, D.C., 130 winning tripartite teams were honored – the most in ZISA history. Altogether, the winning teams accounted for more than 24 million injury-free hours worked in calendar year 2016. The ZISA Certificate of Merit category recognizes projects that have documented between 50,000 and 199,999 work hours performed without a recordable injury. Among the Certificate recipients was a team of which Motor City Electric Co. was a key component. 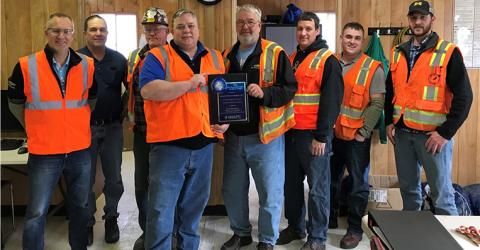 The customer team of General Motors Company LLC (GM), Michigan Building Trades Council, and Commercial Contracting Corporation (CCC) was recognized for 88,269 work hours performed with zero recordable injuries at GM’s Lansing Delta Township Assembly Retooling Project. The $10.5 million electrical project called for installation of new body shop tooling in both existing plant areas and new additions and retooling/kitting existing tooling lines for the new vehicle model year. The shutdown phases required upfront planning and coordination to meet power requirements on the shutdown dates to allow plant personnel time for programming and tool verification. The Buick Enclave and Chevrolet Traverse crossover SUV models are assembled at the plant. James Nugent was the MCE Project Manager and Mike Creason and Matt Brown were the Site Superintendents. Estimating for the project was completed by Jeff Gower and James Nugent. Ted Lindgren, project manager for CCC, was our central point of contact for the project. Our GM customers included Chris Friend, Ryan Morris, John Kerkau, Brett Buda, and James Metevier.